Leviticus 26:2 – Observe my Sabbaths and have reverence for my sanctuary. I am the Lord. I have a new sanctuary. And it’s here at our house. Last fall, a couple gave us a set of wicker patio furniture. They wanted more room in their condo. They also felt our 110-year-old screened-in porch was just the right location for it. Rick and our neighbor, Larry, brought it home. As it was late fall, we didn’t use the furniture very much. Eventually, it went to the basement for the winter. Recently, Rick and his buddy Randy brought it back up and set it on the porch, accompanied with a comment that wherever they put it, it would not be the right location. About a week later, I asked Rick to help me move the furniture. He had washed off the patio table and chairs to also go on the porch. Of course, the wicker furniture was in the spot where I wanted the tables and chairs. With not too much grumbling, we got everything moved around. Last Saturday night, Rick and I were home alone with nothing pressing to do. A first in a while. I made a couple suggestions. His response: “Let’s just sit on the patio furniture and enjoy the night.” This is exactly what we did. It was lovely. I was excited to tell Pat at church yesterday that we had used the patio furniture. Cathy overheard and encouraged me to make time this summer to just sit on the porch. Today was a rare day when I didn’t have anything scheduled right away this morning. 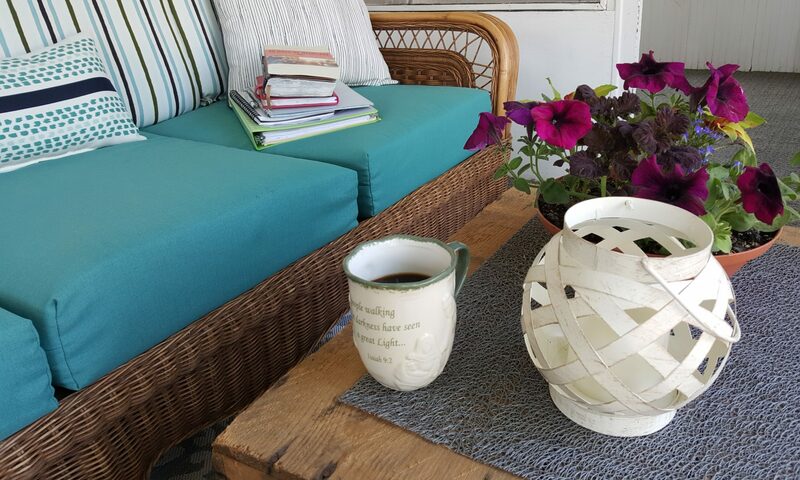 I grabbed my first cup of coffee, devotion books, calendar and to-do list and headed to the porch. It took me about two seconds to recognize this is what I must do every morning. Too often, I bolt through the beginning of my day without getting my heart and mind in the right place. Too often, I fail to dedicate everything I will attempt to do for the glory and honor of God’s kingdom. Too often, other things seem more important than a few minutes caring for my soul. God’s sanctuary can be in a variety of places. A house of worship is most common. Sometimes, people tell me the golf course or their boat is their sanctuary. These can be sanctuaries … when we mindfully seek God’s presence and communication in our lives. Many times, I yearn for a place where it is quiet, I can slow down my heart and mind to hear God. I think I’ve discovered this place for me this summer. I only have to walk down the upstairs steps and out the front door to find it. Almighty God – wherever we go, You are present. Wherever we pause, your still, quiet voice can be heard. I pray we can find our own individual sanctuary spaces to be with you Lord God. May these little sanctuaries be a daily place we seek and great You. Amen.